For many years the local people of the Puy-de-Dôme department, regional players, and numerous French personalities have become involved in the application proposal in order to raise the profile of the site. Today, thanks to everybody joining in, the support committee has more than 50,000 signatures, and a growing number of people log on to the application’s Facebook page. Local support has also been shown by projects of a personal (photographic contributions, globe-trotter campaign, etc.) and collective nature (presentation of the project in neighbourhood meetings, distribution of leaflets by sports clubs, organisation of events, etc.). 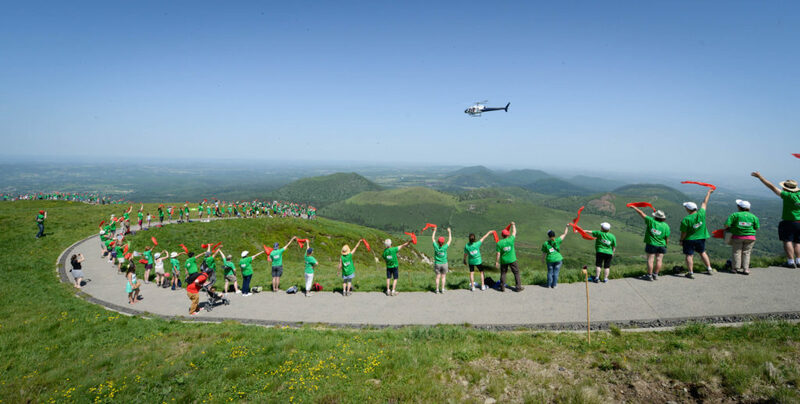 Of the 470 communes which make up the Puy-de-Dôme, 468 have decided in favour of the application, including the 30 communes which lie on the site perimeter. The local economic players have also been active in passing on the project’s message, which has served to raise the employees’ and clients’ understanding of the site’s value and the necessity to protect it. A large number of the local press signed an commitment letter in the Media Pack to give their seal of approval to the project. This letter represents an essential means of disseminating images and information about the Chaîne des Puys and Limagne fault. Many local and national celebrities have given their support to the project and have talked about it during the national selection process: Laurent Bignolas (sponsor for the Media Pack), Patrick Poivre d’Arvor, Louis Villaret, Françoise Héritier, Claire Chazal, Laure Adler, Patrice Corre, Renaud Lavillenie and Hubert Vedrine, to cite but a few. From the outset of the project numerous economic partners have been established through a convention in which the business agrees to carry out communication initiatives. Now, following the recognition of the site’s outstanding universal value and the implementation of the first measures in the management plan, the local economic players have been encouraged to develop their commitment by investing concretely in management measures aimed at the preservation and development of the site.